3D Lemmings (or Lemmings 3D) is a remake of the original Lemmings which was released in 1991 for the Amiga. 3D Lemmings was released in 1995 for the PlayStation, PC and the following year for the Sega Saturn. The goal was the same as the original which is to lead as many Lemmings as possible through a level filled with obstacles. 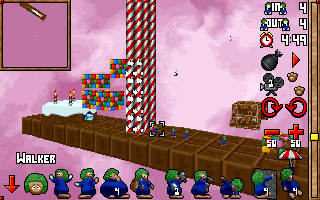 Gameplay is accomplished by assigning skills to individual lemmings as needed. For instance, you might need one Lemming to block others from careening off a cliff to their deaths. Or another to dig a whole to get to a lower level and closer to the exit. There are a variety of tasks that can be assigned and your goal as to keep as many lemmings as possible alive through each level. When you run out of lemmings, the game is over. The original 2D version of this game was a masterpiece of originality. There really wasn’t anything quite like it when a came along. The lemmings simply move steadily across the screen and you must click on them (ideally using a mouse) and assign tasks so that they end up avoiding obstacles and getting to the exit. The original Lemmings was ported to a massive number of video game and computer systems throughout the early 1990s. 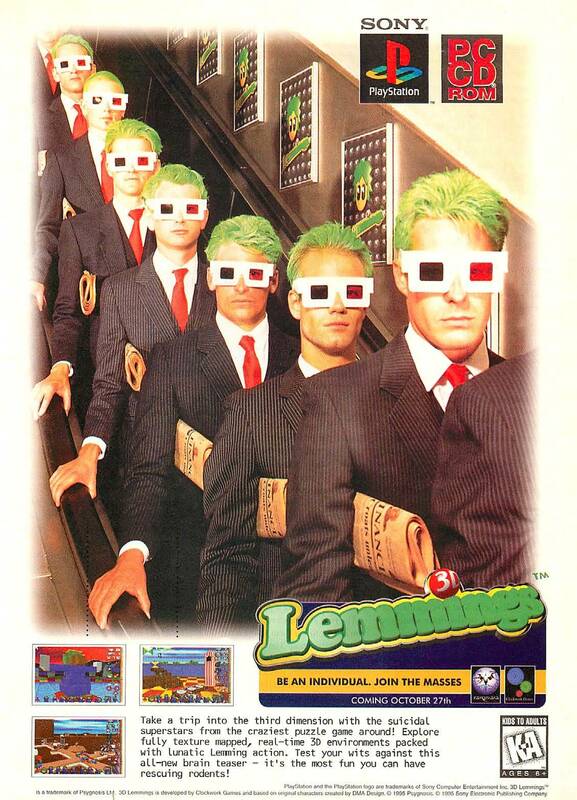 this version of Lemmings puts you in a 3D world. This makes it a far more difficult game to learn as you will find yourself constantly switching camera views to figure out what is going on and what you need to be doing. However, with some practice you’ll get used to it and it really is well implemented even if it can be difficult to learn. As far as I know, this version of Lemmings has never been re-released. While there are a number of other re-releases and remakes of Lemmings, most are of the 2D variety. Personally, I greatly prefer the 2D versions of Lemmings but if you are looking for a 3D version, grabbing a copy of this game for your PS1 or Saturn (or DOS capable PC) may be your best bet. The ad above is from 1995 and mentions the PlayStation and DOS versions of the game. The Saturn version would come the following year. 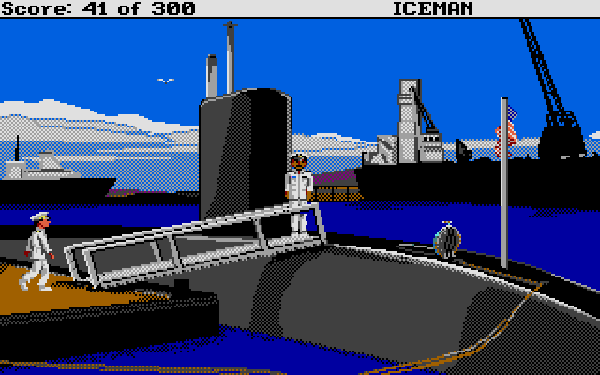 Screen shots are from the DOS (PC-CD) version of the game. Space Quest V is one of a long line of point and click adventure games from Sierra. Both the Space Quest series and the King’s Quest series used basically the same interface, at least during this time period. Game play is pretty simplistic. You just click on an action and the game takes care of the rest. The Space Quest series was somewhat unique in that it was a science fiction parody. It makes fun of a lot of science fiction shows like Star Trek through exaggerated imitation. Unfortunately, this isn’t one of the better Space Quest games. It’s not that it’s terrible or anything but it is way to short (it can easily be finished in a day) and the plot is mostly forgettable. However, if you love point and click adventures and/or the Space Quest or King’s Quest series and haven’t played this one yet, then it is worth a play through. If you are intent on playing the Space Quest series though and haven’t played the other yet then you might as well start with the first one. You can of course track down an original copy on eBay and get it running in DOS Box or you can go the easier route and get it on GoG (https://www.gog.com/game/space_quest_4_5_6_). You’ll get three games for a lot less than you’ll probably be able to get one of them on eBay. 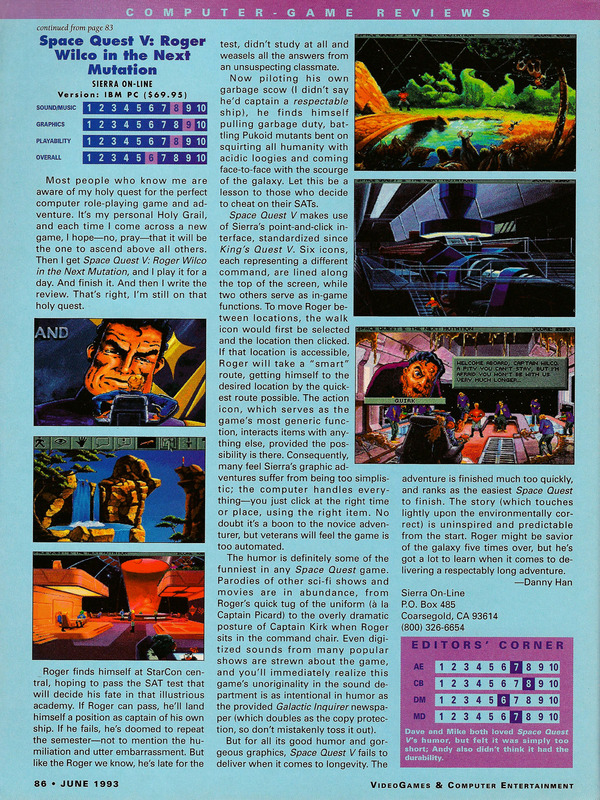 The review above is from the June 1993 issue of VideoGames & Computer Entertainment.